Although I've watched the new Doctor Who series before, I unfortunately missed the bandwagon when it was first aired in Australia and have been slowly catching via re-runs and DVD collections. It's a thoroughly entertaining series and definitely fleshes out the character Doctor Who with a 21st century spin. 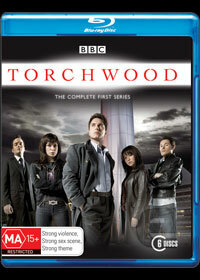 However, the current Doctor Who series as with the original is enjoyed by all ages, however interestingly enough, a spin-off series from the same universe was created, called Torchwood. Unlike Doctor Who with its over the top plots and stories that can be watched by all ages, Torchwood was a darker series and was aimed at the adult market. This parallel is similar to when the excellent TV series Angel spun out of Buffy the Vampire Slayer which was a more aloof and fun series, as opposed to the darker and more adult content of Angel. With parallels aside, Torchwood is a cleverly written modern science fiction series that revolves around an elite team from the Torchwood Institute in Britain. Similar to the Urban myths of Area 51 and men in black, Torchwood are also responsible for investigating paranormal and scientific anomalies. With a team comprised of strange personalities and even stranger backgrounds, Torchwood is lead by Captain Jack Harkness (John Barrowman), an immortal who has a shrouded past. Joining Jack are Dr. Owen Harper (Burn Gorman), technophile Toshiko Sato (Naoko Mori), support officer Ianto Jones (Gareth David-Lloyd) and new recruit Gwen Cooper (Eve Myles). With such a diverse personality and range of backgrounds, the Torchwood team often come head to head with some of the investigations that they face. Of course, Torchwood would not succeed without the diverse acting skills of all involved and although the special effects are somewhat limited to Doctor Who caliber, they are classic BBC special effects that range from impressive to laughable, however this should not distract from the engaging story telling. At times, Torchwood is almost a social commentary of the world and just when things start becoming a little dry, the viewer is thrown a curve ball that once again sparks their interest. The universe of Torchwood is quite dark, especially how they resolve a variety of conflicts that they encounter, often causing rifts among the crew. As the first series progresses, so do the histories of each character and this is the gem of Torchwood as each episodes gives another glimpse into the characters of this intriguing organisation who don't officially exist. At times the series features those science fiction clichés, however these moments are quite few due to the well written plots. However, as per usual, season one finishes with a cliff hanger moment and there were only a few episodes in the series that were a little ho hum. As the series is filmed in high definition, the transfer to Blu-ray is quite good for a TV series with sharp picture quality, vibrant colours and generally strong blacks. To compliment the decent video quality, the series features a DTS HD 5.1 mix that boasts crystal clear dialogue and good levels of sound. Even though it cannot be compared to modern movie Blu-ray transfers, the BBC should be commended on their effort for Torchwood the Complete First Season. When it comes to extras, the Blu-ray is littered with goodies from a plethora of audio commentaries for the episodes that features those on screen and behind. Thankfully they go into some in-depth detail of the production of the series, including a few issues and humourous moments behind the scenes which is always fun. There are also some standard definition featurettes that include production featurettes, "Torchwood Declassified", Deleted Scenes and the entertaining "The Captain's Log video diary". Definitely a fun journey for those fans of the series and helps with almost everything you wanted to know about the universe of Torchwood. At the end, Torchwood the Complete First Season is definitely a must have Blu-ray for fans of the series or for those who may have missed the series the first time around and are looking for a well-written science fiction series. Sure, some of the special effects may be a little embarrassing, not as bad as Doctor Who but the star of Torchwood are the characters and of course that the stories have been written for an older market. With a plethora of special features, Torchwood the Complete First Season will keep you entertained for a lengthy amount of time.